Step into the lecture halls of the prestigious Miskatonic University! The world of Arkham is larger and more terrifying than previously thought, but the members of this hallowed institution's faculty have seen true horror and stared into the face of madness. Heed their lessons well, for your ability to stand against ultimate cosmic evil and to survive with your mind intact is about to be put to the test. 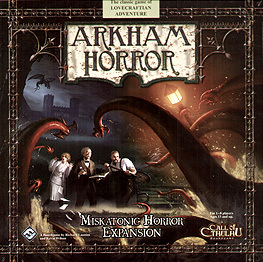 The Miskatonic Horror expansion provides components to supplement every expansion of Arkham Horror! Regardless of whether players are using The Curse of the Dark Pharaoh (Revised Edition), Dunwich Horror, The King in Yellow, Kingsport Horror, The Black Goat of the Woods, Innsmouth Horror, or The Lurker at the Threshold expansions, or simply the base game of Arkham Horror by itself, they'll find a wealth of new resources for the ultimate fight against the ancient forces that threaten to invade our world. Miskatonic Horror also introduces Institutions, powerful human organizations that will, for a price, aid investigators in their struggle. Miskatonic Horror requires a copy of Arkham Horror to play. Even if players are using only the base game of Arkham Horror they'll be able to use several new elements found in Miskatonic Horror. However, most of the components included here are designed to supplement those found in the other Arkham Horror expansions. The more expansions that players have availahble to them, the more of the components in this expansion they will be able to use.